The nations of Haiti and the Dominican Republic are both located on the island of Hispaniola. The two nations have much in common, but are also different in several important ways. For example, Dominicans speak Spanish, while Haitians speak French and Creole. The Dominican Republic is twice as large as Haiti; it also has a much better economy. These differences, and others, have driven a wedge between the two neighbors in the past. Now, a new policy is threatening this relationship once again. 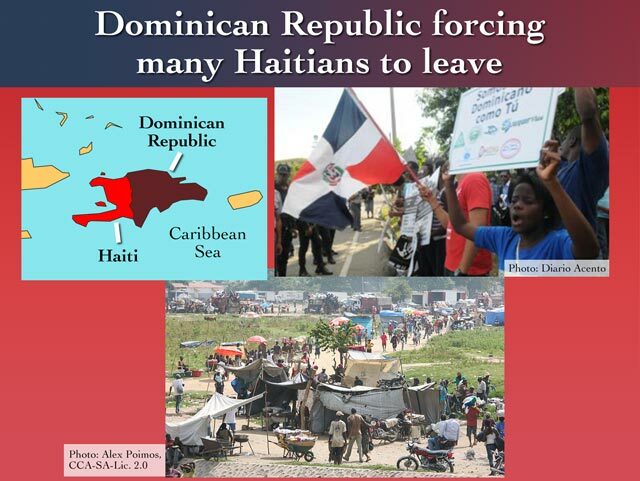 Since the ruling, there are signs that the Dominican government is preparing for a mass deportation of Haitians. In fact, there are now “refugee camps” along the border of the two countries, filled with people who say—in both Spanish and Haitian Creole—that they were rounded up and dumped there. According to government spokespeople, however, no one is being deported. The government claims these people have decided to “voluntarily” go back to Haiti. Rafel Trujillo (top left), was a dictator who ruled the Dominican Republic from 1930-1961. Friction between Haiti and the Dominican Republic goes back almost to their independence movements in the early 19th century. Before then, Haiti was a French colony, and the Dominican Republic belonged to Spain. Soon after these new nations became independent, they spent decades fighting each other for control of the island. When this finally stopped in the 1870s, both governments went through long periods of political instability and U.S. occupation. 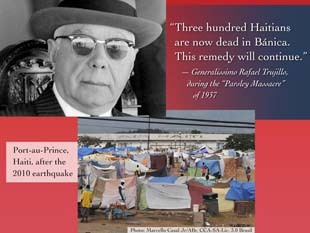 Today, the largest threat to Haitians is economic. Haiti was already one of the poorest nations on Earth before an earthquake devastated the country in 2010. The Dominican Republic, on the other hand, has the strongest economy in the Caribbean, and pays workers six times more than they can make in Haiti. For many, this new policy has seemed to come out of nowhere. After all, despite their problems in the past, the Dominican Republic was the first country to send emergency help to Haiti after the earthquake. This response saved Haitian lives, and marked a new high point in the relationship between the two countries. And Haitians have been working in the Dominican Republic for decades—both legally and illegally. Traditionally, they found jobs as farm laborers, nannies, and domestic help. Now, more Haitians are working in Santo Domingo and other cities. 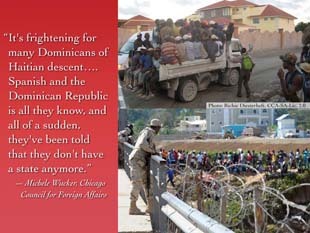 It is an open secret that the Dominican construction industry relies on undocumented Haitian workers. Everyone agrees that the Dominican Republic is within its rights to set and control its own immigration policies. But many are upset about the suddenness of the policy change and how it is being enforced. The new rules would expel many Haitians who have lived and worked in the Dominican Republic for decades with no problems until now. It also applies to many thousands of people who were born in the Dominican Republic. These people speak Spanish, not Creole, and consider themselves Dominican instead of Haitian. In fact, many of them have never even visited the country from which their parents or grandparents or great-grandparents emigrated. The Dominican government had announced that its policy is only focused on Haitians who have come over in the last four years, and that there will be no “mass deportations.” But not everyone trusts this statement. Some reports say that 40,000 people have already left the Dominican Republic, fearing mass deportations that are set to start in August. And refugee camps are appearing along the border between Haiti and the Dominican Republic, prompting fears of a new humanitarian crisis there. Previous Sticking with the Classics: Why Ancient History is Thoroughly Modern by Rosamond van W.